I must start by saying what a ride it has been over the past few years. We are starting to settle into life in the PNW after what felt like several years of chaos. Liz is in middle school, Steve is still with his company, and I am working at the same middle school Liz is attending as well as continuing to do the contract work for the dental education company and playing taxi for Liz’s extracurricular activities. Somewhere in all that, I try to squeeze in some writing and sharing our love of trying new recipes with you. Since we are talking about the New Year and since I’ve promised to share this recipe forever, here is my chicken curry recipe. I started making chicken curry after we were invited to my Grandmother-in-law’s 90th birthday party. The meal was a catered curry night. Mums was a true character and we miss her to this day. Soon after that party, Steve asked if we could try to make curry. Back then, we didn’t have Pinterest (I know right?) so I went straight to Google. My first attempt at Curry was Rachel Ray’s Chicken Curry in a Hurry. I have, over the years, modified the recipe to what I share with you. This chicken curry has become our traditional New Year’s Eve meal. It is easy and works really well for large groups. To start, place 4-5 boneless skinless chicken breasts in a slow cooker, cover the chicken with water, and season with one bay leaf, a teaspoon of garlic powder, 1/2 teaspoon of dried parsley, and 1/2 – 1 teaspoon of curry powder. Set the slow cooker to low and allow to cook 6 hours (or on high 4 hours) until the chicken is cooked through and is tender. Remove the chicken and shred on a cutting board. Discard the bay leaf from the broth but save the broth to make the curry. In a large saute pan, add 2 tablespoons of olive oil. Heat on medium. Add 1/2 of a large white onion chopped. Allow to saute until just starting to turn opaque. Add one teaspoon of fresh ginger (I like to keep a jar of Christopher Ranch ginger in the refrigerator) and 2-4 cloves of fresh chopped garlic. Saute together for 3 to 5 minutes. Add about 3 cups of the broth from the chicken to the pot (you may need to add more if it is too thick once you add the chicken) and bring to a simmer. Add the chicken and stir. Then add about 2-3 tablespoons of green curry paste. The more you add the spicier it gets! Let the chicken mixture simmer for five minutes or longer. If I am making this for a crowd, I put the curry back in the empty slow cooker and let it sit on low (or warm) until ready to serve. While this is simmering, make basmati or jasmine rice. Lately I’ve used the boil in the bag kind simply for the ease. Sometimes I add fresh cilantro and lime juice to the rice when it is done (this of course is completely optional). The best part about the curry is mixing and matching toppings! On a plate or in a bowl, add rice and chicken curry. The pick your toppings. I serve curry with roasted peanuts, currents, shredded coconut, mango chutney, and pita bread. You can always add almonds or cilantro. Another option, which I am considering for next time I make this is to add potatoes and carrots to the slow cooker and mix them in with the curry. Thai 65 restaurant here in Renton does that and they are delicious! So there you have it! Our New Year’s Eve Chicken Curry. To start, place 4-5 boneless skinless chicken breasts in a slow cooker, cover the the chicken with water, and season with one bay leaf, a teaspoon of garlic powder, 1/2 teaspoon of dried parsley, and 1/2 - 1 teaspoon of curry powder. Set the slow cooker to low and allow to cook 6 hours (or on high 4 hours) until the chicken is cooked through and is tender. Remove the chicken and shred on a cutting board. Discard the bay leaf from the broth but save the broth to make the curry. While this is simmering, make basmati or jasmine rice. Add fresh cilantro and lime juice to the rice. On a plate, serve with the rice, add the chicken curry mixture and toppings. Optional: add potatoes and carrots to the curry by stewing them with the chicken. 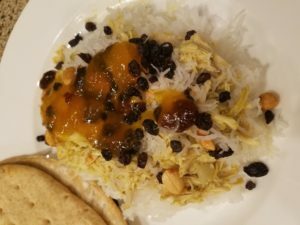 This entry was posted in Asian, Chicken, Slow Cooker, Thai.